Folding baby seat for use as a highchair or a handy travel chair when visiting friends and family. It fastens onto the adult chair using two straps. This Booster is fitted with a 3 point seat belt to secure baby. 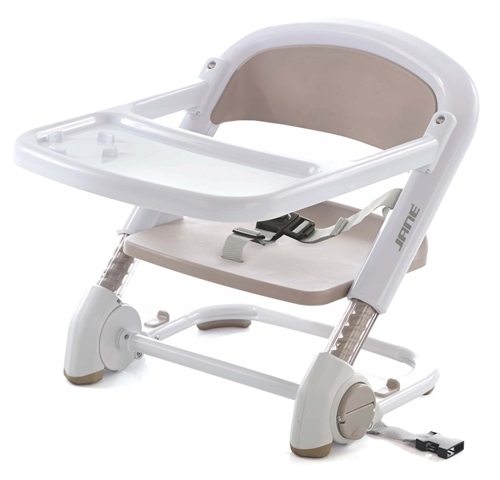 You can even accommodate a growing baby or different table heights by simply raising the height of the Booster by turning its clever retractable lever. Includes a detachable tray. Easy to transport with its travel bag. Easy to transport with its own travel bag. Made from wipe clean materials. Ergonomically designed for optimal baby comfort.